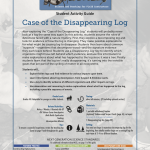 After exploring the “Case of the Disappearing Log,” students will probably never look at a log the same way again. In this activity, students assume the roles of detectives faced with a nature mystery. First, they explore a decomposing log and look for evidence of how the log is changing. They make possible explanations for what might be causing log to disappear. Students then learn about common “suspects”—organisms that decompose wood—and the signature evidence they each leave behind. Students use a Disappearing Log Key to identify which organisms might have left behind which evidence, and use this information to make explanations about what has happened to the log since it was a tree. Finally, students learn that the log isn’t really disappearing, it’s turning into the invisible gases that are part of the cycling of matter in all ecosystems. Explore fallen logs and find evidence for various impacts upon them. Learn information about log decomposers from Suspect & Evidence cards. Use a key to identify evidence of different organisms and other impacts on logs. Use observation and reasoning to make explanations about what has happened to the log, including a possible sequence of events.